Around the corner of 25th St. and Imperial Ave. in Grant Hill is a vibrant, family-owned coffee house that serves its customers more than fresh coffee and pastries. 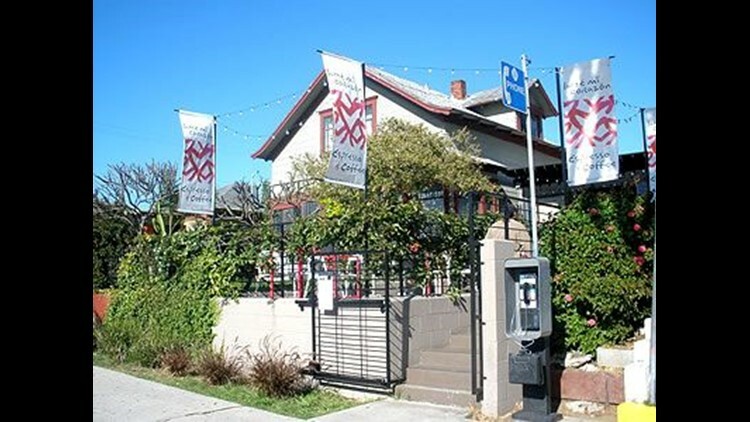 Latté Mi Corazón Coffee Bar and Garden, owned by Gerardo Guzman, Jerry Guzman and Ricardo Medina, prides itself in being avidly involved in its dominantly Latino community. Colorful umbrellas, white lights and heart-filled banners let new visitors know they have reached their destination. Steps leading to the cozy and eco-friendly coffee house are adorned with plants and flowers and welcome in patrons. Ample outdoor and indoor seating is available, but those indoors can appreciate the artwork by local artists. Latté Mi Corazón specializes in a variety of hot and cold beverages including espressos, lattes, mochas, coffee and tea. The menu is written in Spanglish to cater to its English and Spanish speaking customers. Creative names give classic favorites a Latin twist, such as el gringo – the classic Americano, melatté – coffee with milk, yerbabuenota – a combination of mint, espresso and steamed milk, chocolatina – Mexican hot chocolate and la güera – a white chocolate mocha. But Medina said people must try their signature meximocha – a sweet and hot mocha drink mixed with a shot of espresso. Everything on the menu ranges from $2 to $4, including pastries. All coffee is made fresh using 100-percent organic coffee beans from Latin America. The owners said they plan to market and sell their own coffee brand soon. Those at work can order fresh coffee to be delivered to their office or company and share with others at work by calling between 8 and 10 a.m., Monday through Friday. The 96-ounce carrier, which serves 12 people, costs $20 and includes cups and condiments. Previously known as Chicano Perk for six years, its name was changed nearly a year ago because of new ownership. The name, Latté Mi Corazón, was chosen to represent the family's passion for its culture and commitment to serve their neighbors and community. Born and raised in the home next door to the coffee shop, Jerry Guzman said being active in his community has always been a priority. As the assistant executive director for Sherman Heights Community Center, Guzman strives to meet the needs of Latinos and ensures their issues and voices are heard outside his coffee business. "I feel that as a resident, not only am I advocating for myself, but also my neighbors," Guzman said. "Our community is very diverse … I try to put myself in everybody's place and really make sure that I am advocating for all of our residents." Aiming to unite those from neighboring communities as well, they continuously hold special events including live music and art exhibits, book signings and movie nights. They also support and participate in Latino holidays and events including Fiestas del Sol in the summer, Cesar Chavez Day in March and Día de los Muertos in November. "With so many different groups that are out there, Latté Mi Corazón provides a venue for people to get together to organize and have meetings," Medina said. "It's for the betterment of the community … We feel that we in a way have filled a void in our community as a place where people can get together." For those craving a yummy cup of coffee in a comfy atmosphere, the café opens Monday to Friday from 6:30 a.m. to 9 p.m., Saturday and Sunday from 8 a.m. to 1 p.m.